UPDATE: THE OSCARS had a very healthy adjustment to a 7.7 final rating, up 1.1 from the preliminary number. Last year, the adjustment was only 0.4 for a final 6.8. Total viewers ended up at 29.6M, up from last year’s 26.5M. 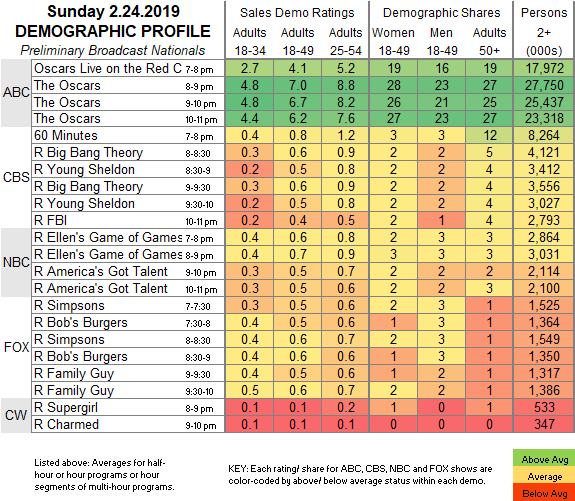 WHISKEY CAVALIER, which began around midnight in most of the country, was at 0.8/4.7M. Hostless is the new black. ABC: THE OSCARS, despite (or because of ) its tide of controversies, had a slight rise in early numbers, up 0.2 to 6.6 from last year’s preliminary all-time low. Reminder: the early ratings are distorted by live viewing in the Pacific time zone. For example the 7-8PM hour contains viewing of the red carpet arrivals show in most of the country (Eastern and Central time zones) and viewing of the 10PM ET portion of THE OSCARS in the Pacific time zone. The 8-9PM hour contains viewing of the first hour of THE OSCARS in the East/Central and viewing of the post 11PM portion in the Pacific. The time zones will be be properly adjusted tomorrow in the official nationals. The 7-8PM numbers below should go down -30% to -35% in the official nationals, while the 8-11PM numbers should rise +5% to +9% in the official nationals. In addition, note that since WHISKEY CAVALIER aired out of primetime in most of the country, it isn’t included in Nielsen’s overnight ratings. CBS: The only other original telecast of the night was a steady 0.8 for 60 MINUTES. After that, the network aired reruns at 0.4-0.6. Tonight, the midseason cycle of THE VOICE begins on NBC followed by the premiere of THE ENEMY WITHIN.